This article was published in The Big Issue in July 2009. Walking through the village of Ayn Hawd, high in the hills of Mount Carmel, life appears too peaceful for a community of outlaws. The Mediterranean, a blue blur on the horizon, gifts a gentle breeze as old women stroll from house to house. Children amble out from a tiny school. It’s quiet enough to hear the patter of lizard feet across the crimson walls of the cafe. The cafe belongs to Mohammed Abu Haija, whose grandfather created this settlement from cattle sheds when his Arab village – five miles down the road – was seized by the victorious Israeli army in 1948. The original village was turned into a Jewish artists’ kibbutz and given the Hebrew name of Ein Hod. This left the 50 or so families of the new Ayn Hawd cut off from the state, unwelcome and unrecognised, like many others across northern Israel who were unwilling to be packed into designated Arab towns. 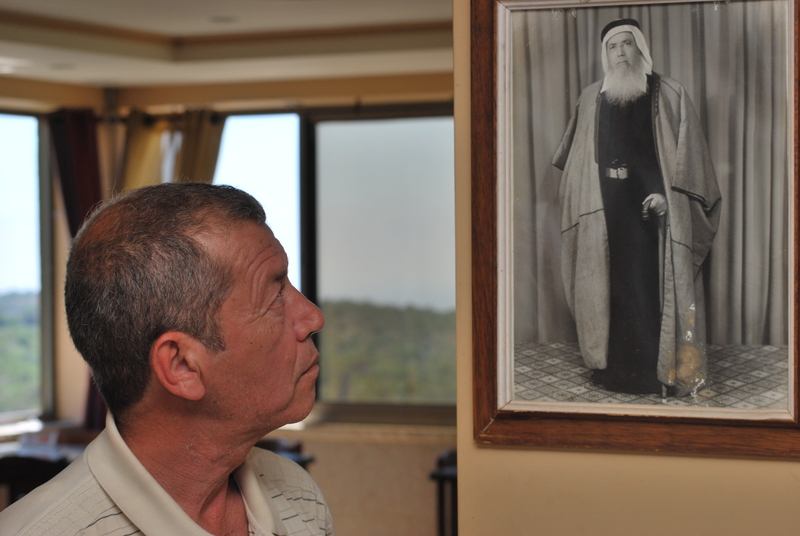 Mohammed Abu Haija (above, with a photograph of his grandfather), the inheritor of a long family struggle, looks out the window at the valley below, his faced lined and eyes reddened from the decades-old struggle for status and basic amenities like electricity. The Arabs make up almost 20 per cent of Israel’s population, but their troubles are largely forgotten as long as the blood and thunder of Gaza and the West Bank continue to capture all the headlines. To be both Arab and Israeli is not the easiest of identities to manage. There is a saying among the minority here: “My country is at war with my people.” While the exodus of Palestinians in 1948 remains such a vociferous rallying cry across the region it is easy to neglect the displacement of those left behind. More than 60 years later, planning laws still forbid prescribed Arab settlements from any expansion beyond “blue lines”. Serious overcrowding and squalor is the inevitable result. Things have become even trickier since the general election a few months ago, when Avigdor Lieberman’s far-right nationalist party announced itself as a major political force. The Union for Reform Judaism called Lieberman’s anti-Arab campaign “outrageous, abominable, hate-filled”. Upon becoming Prime Minster, Benjamin Netanyahu made Lieberman foreign minister and a key ally in his coalition government. Lieberman is now demanding the minority pledge allegiance to Israel as a Jewish state, or lose citizenship. Arab street protests in the wake of attacks on Gaza and Lebanon in recent years have raised fears their sympathies lie with Israel’s enemies. Lieberman refers to the small handful of Arab members in parliament as pro-Hamas “collaborators”, telling them prior to the election that “a new administration will be established and then we will take care of you”. Although Arab citizens already face restrictions on visiting family in the Muslim world and on marrying anyone from the occupied territories, one of Lieberman’s loyalty laws has proved more provocative than any of his previous ideas. His Yisrael Beiteinu party is trying to push through a ban on all commemoration or teaching of the Nakba (the “catastrophe”) – the day the Arabs mark the loss of Palestine. Only one interpretation of history is to be allowed. These are depressing developments for the diminished Jewish leftists, and organisers of the Arab community. Dr Adel Manna, one of Israel’s leading academics in Arab affairs, believes suspicion has hardened into hostility. Like many Arabs, he can recount the interrogation he and his family receive at Tel Aviv airport, and cites a recent report suggesting 67 per cent of the Jewish majority believe anyone defining themselves as Palestinian is an enemy of the state. Almost the same proportion, 68 per cent, would refuse to live in the same building as an Arab. “If you call yourself Palestinian, you are immediately part of a fifth column, somebody the security forces will need to look at,” Dr Manna explains. “If the government is excluding me from real citizenship, why should I continue calling myself an Israeli? In Nazareth, the largest Arab town in Israel, the gleaming minarets and holy crosses studded across the skyline can’t hide the torpor of life below. Tourist pilgrims trickle out from ancient churches and back onto tour buses – shops and cafes left almost empty. The young men sit around on steps, talking and joking with school boys traipsing home, some of whom will be joining them on the sidelines before too long. Unemployment is almost 20 per cent here, and income is half the national average. 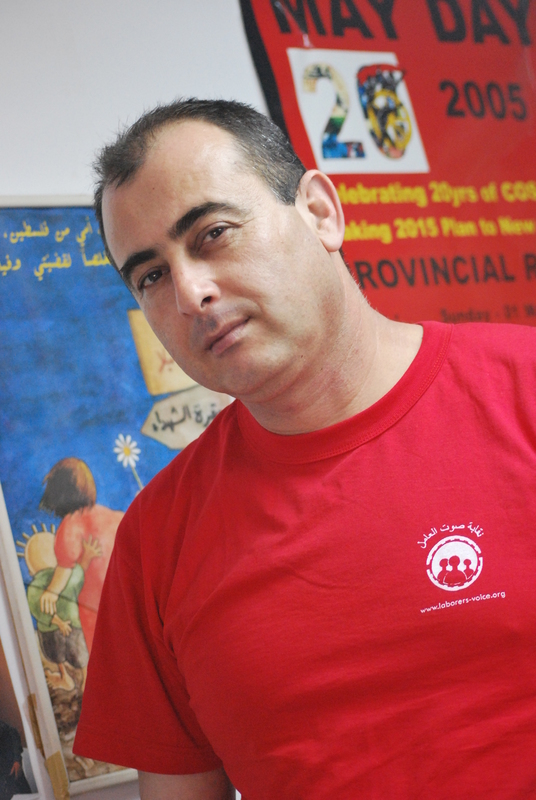 At the office of Labourer’s Voice, union organiser Wehbe Badarni (left) paints a bleak picture. Arabs are almost entirely excluded from all state-related jobs, including electricity, transport and the civil service, often on the pretext of security. Recent changes to the benefit system have forced all unemployed adults to sign up for 40 hours a week of pre-job training or voluntary work. “There are very few jobs; very few options,” says Badarni. “Lots of people have been sent to do voluntary jobs for no wages, so they are spending eight hours a day cleaning or doing secretary work in a school for nothing. It is like slavery. In March, the state-owned Israel Railways introduced a policy that required crossing guards to have military experience. Since Arabs don’t serve in the army, it establishes a de-facto “Jews-only” rule. One of the workers set to be laid-off, a man in his thirties who wishes to remain nameless, explains the frustration among his colleagues. Outside the union office, a siren pierces the air, the signal for Home Front Command drills going on across Israel all week. The country is running a series of scenarios simulating attacks from its neighbours and an internal uprising of the Arab minority. Badarni shrugs. His colleagues carry on with their day. “The state is more worried since the second intifada (the Palestinian uprising in 2000) because there is solidarity with the West Bank and Gaza. And so there is more discrimination and greater levels of fear and hated,” says Bardarni. Across town, Fuad Farah (above) calls up memories of a real war. The Christian Arab lives in a small house right next door to his beloved Greek Orthodox church. From the lemon trees on his terrace it is possible to see the spot Gabriel is supposed to have announced to Mary that she was to give birth to the Messiah. 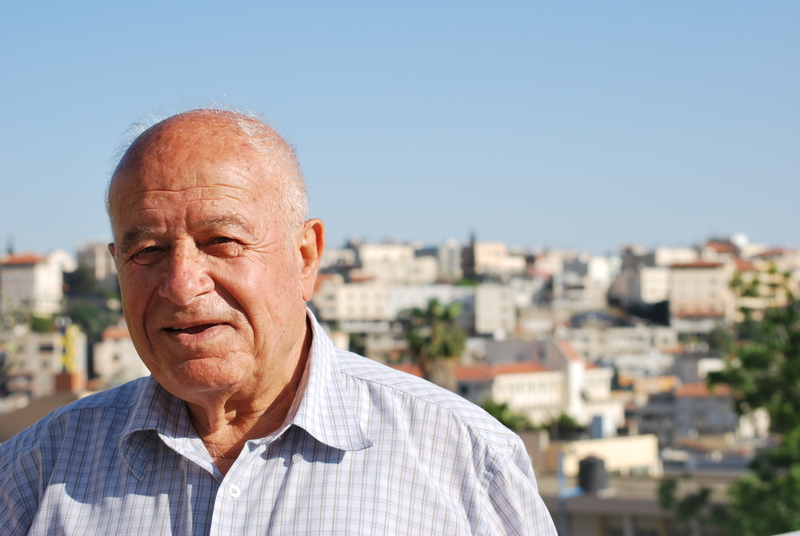 Now 79, Farah was a young man the day the Jewish forces rolled into Nazareth in 1948. “I remember it well. It was a hot day and I was working in a British bank here – a Barclays bank – when my father came in to tell me what was happening. Some people fled. Some people returned after hiding in the woods. Some people thought, ‘This is a holy city – the mother of God is here – she will protect us’. Farah describes the aftermath of Israel’s victory, when Nazareth “was like Gaza today”, and recounts the laborious process of restoring an adequate water supply, getting electricity connections and creating a sewage system. Despite material progress, he believes underlying attitudes are unchanged. “We are still looked upon as just Arabs. The Jews did not care whether we were Muslim or Christian Arabs in 1948, and they don’t care now,” says Farah. The old man is appalled by the rise of leaders as intolerant as Lieberman. “It’s only natural for us to remember the Nakba. People were taken from their homes in pyjamas. That is their family history. The Jews have their days; they mark the Holocaust. On the north east coast, the city of Haifa is touted as the country’s most progressive in terms of its mix of Jews and Arabs. Sadly, separation is still written in the architecture: the white stone Arab ghetto of Wadi Nisnas is dwarfed by the office blocks being thrown up around it. Walking through Wadi Nisnas’ dusty streets, the 22-year-old Qamar Daher points out Palestinian colours hidden in wall paintings. Daher is a Haifa University student and runs an Arab youth group. She can’t get into nightclubs unless with Jewish friends, but by attending university is more fortunate than many young Arabs. Not only is the cost of university too high for most, no one is allowed to start higher education until the age of 20 – a system that caters for young Jews who serve in the army first. “It means most Arabs have to work and think of a different way of life,” she says. “Drink and drugs are becoming more common because there are not a lot of options. My kids, if they weren’t coming to the youth group, would be smoking hashish or drinking vodka. When I spoke again to the academic Dr Manna, he dismissed the possibility of an intifada inside Israel, or of an Arab minority plot against the state. But he does believe we are witnessing a political awakening. This is the holy land after all, where history refuses to go away. No matter how many ruptures, redrawn borders or new road maps toward peace, the past keeps coming back at you, day after day, year after year. A land without closure, where fresh seeds of resentment are still being sown.